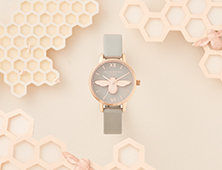 Online purchases from us.oliviaburton.com may be made by individuals who are residents of the U.S., for delivery within the U.S., including Alaska, Hawaii and Puerto Rico. We invite you to visit our international website www.oliviaburton.com to determine if online purchasing is available in your area. You may also click here for a list of authorised retailers around the world. You may locate one(s) in your region by clicking here. Products purchased from Olivia Burton online come beautifully packaged in a signature Olivia Burton gift box. At your request, a complimentary personalised gift card can be added. Simply indicate that the purchase is a gift during checkout and fill in the gift message field. 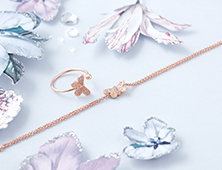 Olivia Burton reserves the right to not transmit gift messaging that contains profanity, abusive or obscene information at the sole discretion of the brand. If you wish to cancel or modify your order, please send an email as soon as possible to hello_US@oliviaburton.com – or call us toll-free at 1-800-810-2311: our hours are Monday–Friday, 9AM–5PM, Eastern Time. We will try to accommodate your request, but once an order has been submitted we cannot guarantee the purchase can be cancelled or modified. Once you have received your online order, please refer to our return instructions included with your shipment. We reserve the right not to accept your order in the event, for example, that we are unable to obtain authorisation for payment; that shipping restrictions apply to a particular item; that the item ordered is out of stock or does not satisfy our quality control standards and is withdrawn; or that you do not meet the eligibility criteria set out within the TOS. We may also refuse to process and therefore accept a transaction for any reason or refuse service to anyone at any time at our sole discretion. We may also, limit or cancel quantities of products purchased per person, per household or per order. These restrictions may include orders placed by or under the same account, the same credit card, the same email address, or orders that use the same promotional code, billing or shipping address. In the event that we make a change or cancel an order, we will attempt to notify you by contacting the email and/or billing address/phone number provided at the time the order was made. Additionally, we may limit or prohibit orders that, in our sole judgement, appear to be placed by dealers, resellers, distributors or any other unauthorised party. You are not permitted to resell any products or services purchased through the Site for commercial purposes. We will not be liable to you or any third party by reason of our withdrawing any merchandise from the Site whether or not that merchandise has been sold, removing, screening or editing any materials or content on the Site, or refusing to process a transaction or unwinding or suspending any transaction after processing has begun. Whilst every effort is made to make sure details on our website are accurate, we may from time to time discover an error in the pricing of products. If we discover an error in the pricing of a product in your order, we will let you know as soon as possible. We shall be under no obligation to accept or fulfil an order for a product that was advertised at an incorrect price and we reserve the right to cancel such an order that has been accepted or is in transit. If you order a product that is priced incorrectly for any reason, we will email or telephone you to inform you that we have not accepted your order and/or that the relevant part of your order has been cancelled. If you have already paid for the goods, we shall refund the full amount as soon as we are able. In the event that products are recalled in transit, we will process your refund once the products have been returned to us. To ensure the secure delivery of your order, all products are shipped via Federal Express. We are therefore unable to ship to P.O. Boxes, AFB or any other addresses not covered by Federal Express delivery. Please allow up to 5 additional days for orders with Embossing or Engraving. Please allow up to 3-4 business days for processing. 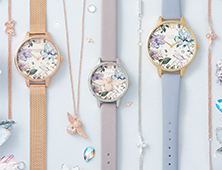 Olivia Burton cannot be responsible for unanticipated delays. We ship to all countries outside the EU on the basis of "delivery with unpaid customs duties". This means that the recipient will be responsible for all sales taxes or import duties that may apply locally to the purchase. 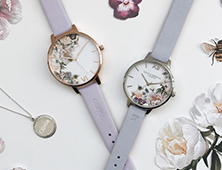 Every Olivia Burton watch we sell comes backed by a two-year limited warranty which covers the movement of your watch if it proves to be defective in either material or workmanship under normal use. Complete warranty information, along with an abbreviated list of authorised Olivia Burton service centres, is provided in the operating instructions, warranty and service guide booklet that will be shipped with your watch. Full warranty information may be found here here and a current, complete list of authorised service centres may also be found here. If you are not completely satisfied with your purchase when it arrives, or if there is a discrepancy in your order, please retain all documentation and packaging and contact us immediately by sending an email to hello_US@oliviaburton.com or calling Customer Service at 1-800-810-2311. Online purchases will be accepted for a full refund when returned in their original condition within 28 days of delivery, and accompanied by the original sales invoice. Please note any redeemable gift with purchase items must be included when returning an order for a full refund. We do not offer an exchange service. If your item has been worn or protective packaging has been removed then your return will not be accepted. Unfortunately, we cannot accept unwanted returns on any products that have been personalised. We are also unable to accept unwanted returns on earrings due to hygiene reasons. This does not affect your statutory rights if goods are faulty or not as described. A Return Authorisation Number (RAN), which may be obtained by calling Customer Care at 1 800-810-2311, is required for all returns. Refunds will be issued to the purchaser in the same form of payment used for the original sales transaction. Please note that Olivia Burton does not assume any responsibility for return packages that are lost, stolen, or mishandled. 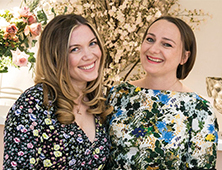 Please note that any Olivia Burton events are non-refundable. The cost of events does not include any transportation to or from the event unless otherwise stated. In the event of cancellation due to unforeseen circumstances by Olivia Burton, a full refund will be issued. Our personalised watches and jewellery pieces are hand-stamped to your specification. Personalised or bespoke product cannot be returned for a refund. These include any goods specifically personalised to your specification and will be clearly marked accordingly. Orders for these goods cannot be cancelled or changed once work has started on them. This does not affect your statutory rights if goods are faulty or not as described. Please see our Terms and Conditions for more details. 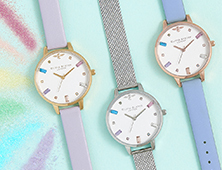 Customers who spend $75 or more on Olivia Burton will receive a complimentary Notebook. 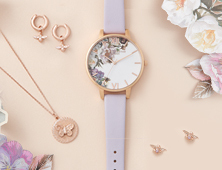 The offer valid until 31/01/2019, to customers shopping on the Olivia Burton website in the UK and US only. The offer is only available whilst stock last. Olivia Burton have the right to remove this promotion at any time. Faulty goods are classified as faulty if they are received damaged or where a manufacturing fault occurs within six (6) months of purchase. Any items that are damaged as a result of wear and tear is not classed as a manufacturing fault. Our goal is to provide complete, accurate, and up-to-date information on our website. Unfortunately, it is not possible to ensure that any website is completely free of human or technological errors. This website may contain typographical mistakes, inaccuracies, or omissions, some of which may relate to pricing and availability, and product information. We reserve the right to correct any errors, inaccuracies or omissions, including after an order has been submitted, and to change or update information at any time without prior notice. While we try to ensure that all prices on our website are accurate, errors may occur. If we discover an error in the price of the merchandise you have ordered, we will give you the option of reconfirming your order at the correct price or canceling it. If we are unable to contact you after 5 business days, we will treat the order as cancelled. Product images on our website are displayed as accurately as possible but colours may vary and we cannot guarantee your computer, phone or tablet will display colours accurately.